I hope you like the change to the blog design. I was playing with a few different looks and wanted to incorporate a three column design going into the summer. It enables me to put a few new links on the left and hopefully make the navigation to my other items easier. Below is an image I captured from the west end overlook. 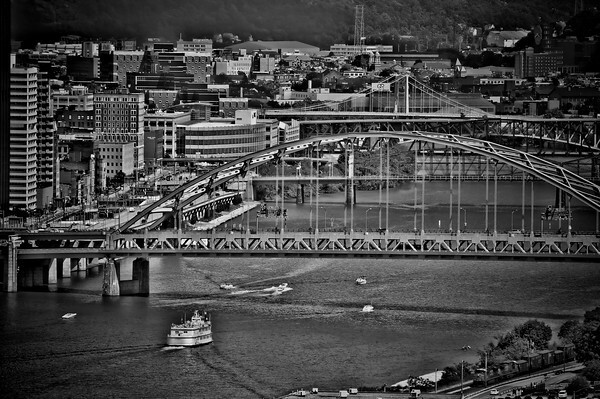 It is an amazing area to view the city and all three rivers merging in front of the triangle. When I shot this image, there was a line of bridal parties waiting to take their wedding pictures with the city behind them. There is no doubt many wedding photographers use this area to take beautiful pictures with the city behind the bridal party. This image was shot with the Nikon D300 and 70-300 VR. Handheld and a polarizer used to cut through the heavy haze from the humidity. Getting into a digital world makes a lot of job easy and interesting too. I have discovered it from the online resoure only. Keep the good job. Digital world has no alternative I guess.